The Dartmouth-Hitchcock Clinicone of the oldest and, today, one of the largest multispecialty group practices in the countryis celebrating its 75th anniversary in 2002. The organization's long run is cause for applause. "I won't quit till I'm a star on Broadway, on Broadway," sang the Drifters in 1963. A decade later, that refrain rang true for a pair of aspiring doctors who were determined to return to New York City to practice among the people they had each grown up with. Today, both are graduates of Dartmouth Medical School and they have offices at opposite ends of Broadway. During World War II, although Dartmouth Medical School graduates and Hitchcock Clinic staff members were scattered far and wide in the service, they kept in remarkably close touch with Hanover. A stream of letters, notes, and cards flowed from barracks and battleships around the globe back to the desk of Dartmouth's Dr. John Bowlerand vice versa. The news in this issue includes insights into the new crop of students (page 8), word of a record-setting jump in research income (page 12), a couple of heartwarming stories about generosity (pages 14 and 15), and more. By Leo R. Zacharski, M.D. 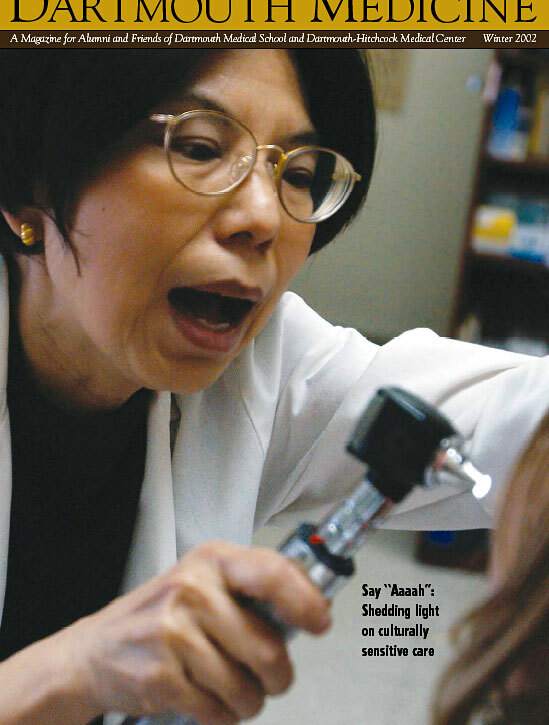 Elaine Choy Lee, a 1979 DMS alumna, is one of two New York doctors featured in a photoessay starting on page 40. The photograph is by Patrick Saine. We are happy to send Dartmouth Medicineon a complimentary basis to anyone who is interested in the subjects that are covered in the magazine. Write us if you'd like to be added to our rolls. Please note, however, that the complimentary subscription offer can be extended only to addresses within North America. Because our mailing list comes from seven separate databases, some readers may receive duplicate copies. Please share extra copies with someone else, or send us the address panels from all copies you receive, and we'll be glad to eliminate the duplication. The contents of this magazine may not be reproduced without permission, but we are usually ableand happyto extend such permission.